If user 0 is infected at time t = 0, then at time t = 1 users 1 and 3 get 1 squawk each, at time t = 2 users 0 and 2 get 2 squawks each, and at time t = 3, users 1 and 3 get 4 squawks each and user 4 gets 2 squawks. Given the layout of a social network and an initial infection site, you need to determine how many squawks are made at some given time t. In the above example the number of squawks would be 2, 4 and 10 at times 1, 2 and 3, respectively. 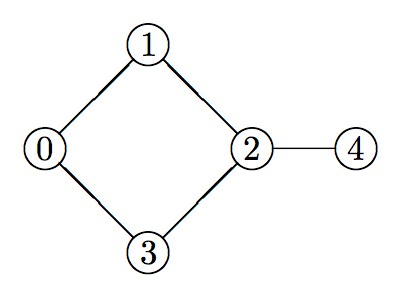 The input will start with a line containing 4 integers n m s t indicating the number of users (1 ≤ n ≤ 100), the number of links between users (0 ≤ m ≤ n(n − 1)/2), the index of the initially infected user (s < n), and the number of minutes (t < 10). Next will follow m lines, each consisting of two integers x y, (0 ≤ x, y < n) indicating that users x and y are connected. Connections are symmetric and no two connections will be the same. Output the number of squawks sent at the specified time t.